Called by many scholars the "most profound letter Paul ever wrote," Colossians warrants a careful, faithful study. In this short, but exciting letter, Paul makes the case for the supremacy of Christ in all things. 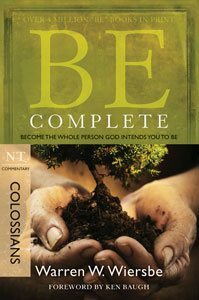 Best selling author and teacher Warren Wiersbe calls your attention to Paul's essential thoughts on living a complete life—Christ alone—in this easy-to-use commentary on Colossians.